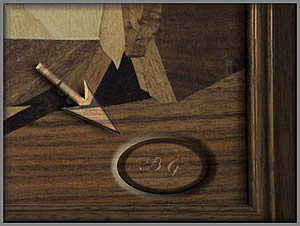 February's update brings us a very special, and very rare, wood inlay picture from the Buchschmid and Gretaux studios. February's update features just one picture, and this is the justifiably famous Buchschmid and Gretaux interpretation of "The Last Supper". Otto Chlup (ABC Studios, Heidelberg) informs us that only two copies of this very important work were ever made by the Buchschmid and Gretaux workshops. It would appear that the statement "that only 2 examples of this title exist" is not a wholly accurate assessment. Go to page 19 for a full explanation. There is a link at the foot of this page. Thank you. One of the copies was owned for many years by a very prominent Canadian politician. Unfortunately we do not know if the politician or their family still owns their copy of this excellent picture. Perhaps they still do; it would certainly be rather pleasant to think that the picture remains with its original owners and is still loved and cherished by them. The other copy resides with its present owner in its country of origin, Germany. The picture we display here is the above mentioned German resident. 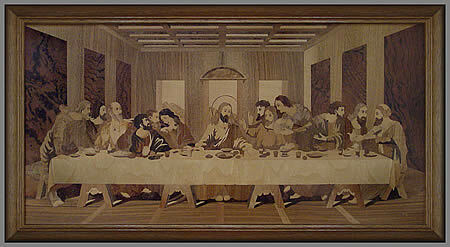 The present owner of the picture tells us that Herr Otto Chlup has verified it as being the true work of Buchschmid and Gretaux, and, most importantly, as being one of the two single pieces made by B & G featuring the Last Supper. This picture of "The Last Supper" appears to be in superb condition and has therefore, presumably been displayed and kept in the best of situations. There is no discernable fading of the veneer colouring; and any cracking of the varnish does not seem to be evident as far as we are able to see. This should all denote careful and respectful maintenance of this wood inlay (or marquetry) work. Around about two years ago one of the copies of this picture appeared in the EBay auctions. Unsurprisingly there was heated bidding for this desirable piece, and eventually it finally went "under the hammer" for well over $2,000. As we say, that was about two years ago; so, it could be well assumed that the value of the picture would have increased accordingly since then. Although, with today's financial market being in its somewhat delicate position, we would advise you to review the perceived values of such art works accordingly and wait until the markets recover in order to ascertain the correct and true values of such works. But, nonetheless, we are sure you will agree with us that this is still a very desirable and beautiful example of the worldly famous Buchschmid and Gretaux wood inlay art work. The present owner informs us that they may however, consider selling the picture if an appropriate offer is forthcoming. Click the above button to return to page 15 of "Can You Help"
Click the above button to visit page 17 of "Can You Help"